I am still doing my best to take part in the projects on Craft Hope. Back in November, the project was making quilts for homeless children. 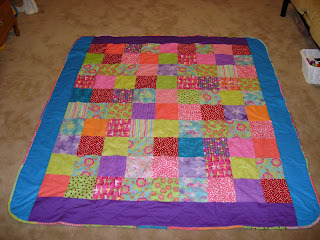 My goal was to make the whole quilt without having to buy anything because I have so much scrap fabric. It took some finagling but I did it! Here's the finished project. Check out Craft Hope and add it to your Google Reader. Jump in on a project when you can! They always have great causes and it makes you feel good when you help others.